The 2015 election started off close and competitive as the fall campaign actually got underway in the summer. After the Alberta provincial election in early May that elected New Democrat Rachel Notley, the national NDP surged to a narrow lead in what is now three-way race. But the national picture is always misleading. Canada-wide numbers are a composite of regional and provincial electoral contests. All three parties currently have leads in different parts of the country. A tight race means that dramatic change could happen in the blink of an eye. Third could become first; first could become third. The final outcome is far from determined. Current headlines emphasize the weak performance of the Trudeau Liberals compared to their chart-topping rise in the wake of Justin Trudeau's assumption of the party leadership in April 2013. 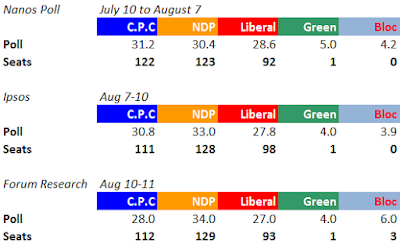 Nonetheless the Liberals remain substantially stronger than in 2011. There have been three polls released since the campaign commenced. 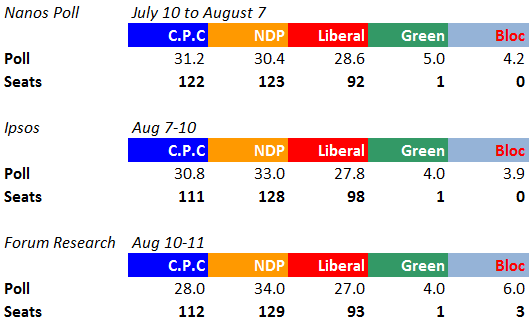 One was the Nanos poll, which was taken over a four week period from July 10 to August 7 so it captured more of the pre-election period than the election itself. The others were a Forum poll and an Ipsos poll taken this week. What was notable about the Ipsos survey is not only was it the first poll after there had been some campaigning, but it used a different methodology than we are accustomed to seeing from Ipsos. Their monthly polls in the past few years have been online. As their news release states "a sample of 2,022 Canadians eligible to vote was interviewed: 1,022 were interviewed online via the Ipsos I-Say Panel, and 1,000 interviews were conducted by live-interviewer telephone (including 40% of interviews conducted on cellphone)". It would appear that Ipsos has greater confidence in their polling if it is not done exclusively online. The individual poll results with my seat estimates can be found below. Early campaign polls and all seat estimates need to be taken with a grain of salt. The Ipsos and Forum polls were conducted following the first major event of the campaign: the television debate. However, the audience size was a fraction of previous debates, so it almost certain that most of the audience consisted of the politically engaged and knowledgeable. Most debate commentary placed emphasis on the relatively even nature of the performances and the absence of a defining moment, but suggested Justin Trudeau may have done better than expected. My guess is that due to its small audience and uncertain outcome, it had zero impact on the distribution of political preferences in the polls. A couple of polls tried to gauge the debate's impact but they should be distrusted. Pollsters face high refusal rates generally, and must make numerous calls before even one survey is completed. The numbers of calls needed to find those who actually watched would have been astronomical. I asked people I bumped into the week before about the debate. Only one person even knew it was coming. The debate itself had amateurish production values and a host, journalist Paul Wells, whose lack of television hosting skill was painfully obvious. The debate situation in Canada this year is a fiasco for which Stephen Harper is squarely to blame. There ought to be a strictly limited number of debates, widely available on broadcast media including television and radio. They should be managed by an independent commission and participation should be based on objective criteria, not the whims of the debate sponsors. The reality is that most citizens have little political knowledge and broadcast debates are an excellent medium for citizen participation in the electoral process. The English debates ought to include the Green Party and the French debates should include the Bloc Québecois. Both parties have demonstrated sufficient levels of support and participation among the electorate to deserve inclusion. The absence of a widely accessible debate means the electorate is more dependent on news clips and ads, information received passively and often inadvertently. The Conservatives no doubt hope that remains the case. Their behaviour suggests they are fearful that a big widely viewed debate will harm their prospects. All of this said, debates frequently have no impact on outcomes despite media assumptions that they will. In the Ontario 2014 election Kathleen Wynne was clobbered in the TV debate and then went on to win a majority. Nonetheless, voters should at least have the opportunity to glimpse the offerings of the the parties and leaders without the filter of the news media. As well, scandals often have less impact than anticipated. Headlines this week are focused on Nigel Wright's testimony at the Duffy trial, and it is true that support for the Harper government was at its lowest in the fall of 2013 at the height of the scandal. If nothing else the news coverage will serve as a reminder of those days. However, I suspect that the impact of the scandal has already been felt, and is priced into the over 20 per cent drop in Conservative support since the last election. It will be difficult and likely impossible for the Conservatives to win back the confidence and trust of the electorate lost in part because of the Senate scandal.